Tips on best place to buy 1x1 plates? I'm wanting to get into mosaic building but haven't pulled the trigger yet. I'd like to get a pile of 1x1 plates to start playing around with but the best price I can find is 10 cents on lego site or about 7 cents on bricklink. I'm wanting black/white/grey/red to start with (got some SW mosaics in mind to start on) but I assume rarer colors will get more expensive and harder to find in bulk. I know every other piece I can use larger than a 1x1 is a better price/stud ratio but 1x1's will always be needed. I called the nearest lego store and they won't sell full boxes anymore. Sad I missed out on that opportunity. I think a full box was about 6k 1x1's for 70-80 bucks? Is there any place to get them closer to that price these days? Anybody have any stores near them with 1x1's on the wall? I browsed ebay but didn't see much better than bricklink and I've always been a little afraid of getting ripped off (knockoff or badly used) on ebay but maybe I shouldn't be. Bricklink hasn't burned me yet so I'll just keep looking there unless somebody has better advice for me. 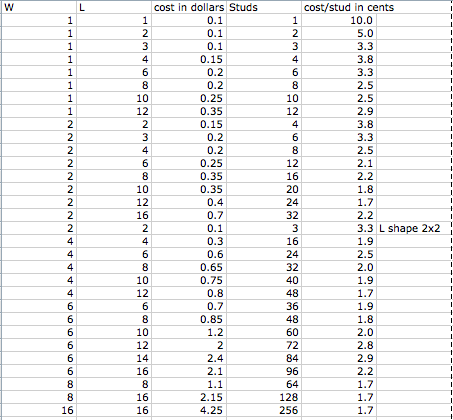 For those interested, here is a chart with prices and price/stud for all the plates available on shop.lego.com. Damn... Are you sure that's right!? I mean they are giving away 1x1 rounds on the pick a brick wall all the time. Can you not pull off the mosaics with rounds, perhaps using 2x2 or larger plates as a lower layer (complimentary colors perhaps)? Yup, I would try to get a list of PAB walls with the plate colors you need and ask someone here if they will get them for you. Very hit and miss though. 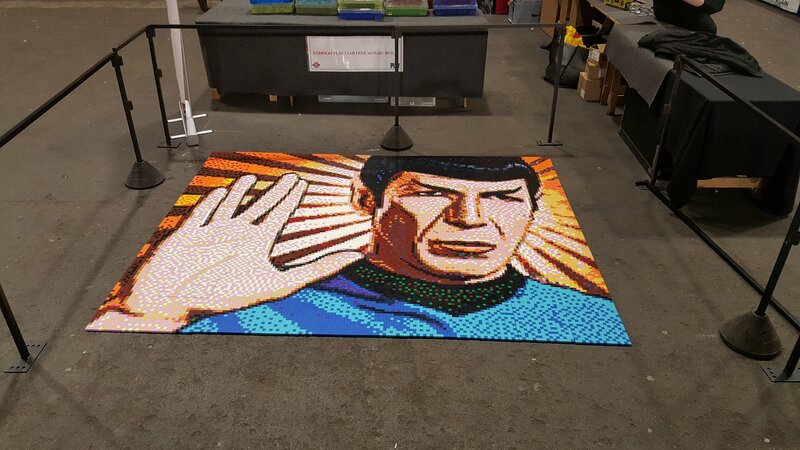 One of my LUGmates took a class on mosaic building at Brickworld one year. During the workshop, it was suggested that 1x1 brick can be a more efficient material to use, due to being easier to source and frequently cheaper than 1x1 plate. They can also be easier to manipulate when putting together the mosaic. Obviously it's heavier when on display and takes up more space, but just thought it was an option worth sharing. Brick built mosaics look just as good as plate and are so much easier to source, afford, build and take apart. interesting thought on using bricks instead of plates. I'll look into prices for bricks. Looking at lego.com and bricklink its definitely cheaper to use bricks if using lots of 1x1's, but cheaper to use plates if you're using larger pieces. You can get under 1 cent per stud with many of the larger plates but its not really possible to get under 1 cent per stud with bricks. Impressive picture SirKevbags. 320x256 = 81920 studs! Looks like 20k 4x4's. I have a special tool I made for removing 1x1 plates from a mosaic. If you glue a 1x16 plate across the top studs of eight brick separators, then you can easily remove 16 1x1 plates in one go. I have though about combining three of them together, to be able to remove an entire row from a 48x48 baseplate, but not sure if there would really be an efficiency saving as it would take a bit longer to ensure that you have aligned it correctly over the whole row before prising them off. Some of the larger plates are "fun" to remove. A 16x16 plate may be cost efficient but sometimes they really stick to baseplates and can be a pain to lift off again. All 2 x 2 bricks on 32 x 32 baseplates so 20,480 bricks. I would love to do a really big one this year, something in the region of 3000 baseplates but it might be just a pipe dream! If you build it , they will come. Or is it: if they come, they will build it? I know: they will come and they will build it!